When accidents happen, your health and even your life may very well depend on what gear you choose. It's a good idea to put some thought into the materials, quality and protection of the gear you wear. et's take a look at the basics. Protect your head! This goes without saying. Although 3/4 and 1/2 helmets are available and quite legal in most countries, the full-face helmet offers the most protection, as the jaw is vulnerable in a crash situation. Also, it is important to consider and carefully choose the type of material when it comes to your safety gear. Traditionally there are two main types: plastic and fiberglass, and most recently carbon fiber helmets which have now penetrated the market in full force. There has been a long ongoing discussion about the properties and characteristics of helmets of the different materials, and we won't go into that here. Visibility, however, is a topic of less dispute. Stay visible. Be seen in traffic. Helmet-wise, this could be achieved by wearing a brightly colored helmet. It is also a good idea to have a good range of vision from inside the helmet. Visit your local dealer and try some different helmets on, and you will see that some helmets offer a wider range of vision than others. 1-piece suits, jacket, pants and gloves are garments that traditionally consist of either leather or of man-made materials that we with a collective term can call textile, or of a mix of the two. Materials like cordura and kevlar have greatly improved textile as a material for motorcycle safety garments, and there is much research being done that eventually will benefit us as motorcyclists. Presently leathers have a big advantage over textile by offering more abrasion resistance. The natural structure of leather is superior to a mesh of synthetic fiber. On the other hand, textile often offers better weather protection, on both cold, warm and rainy days. These and other characteristics like padding in vulnerable regions and seam and material quality, vary from product to product. Like with the helmet, a brightly colored set of clothes will make you easier to spot, which is a good thing as allegedly 75% of all motorcycle accidents involve other vehicles. Boots are also an important part of motorcycle safety gear. Motorcycle boots often provide reinforcement at the ankles and toe area and other features to prevent unnatural bending of joints in an accident. Needless to say, a good pair of motorcycle boots offer far more protection than boots that are not made specifically for motorcyclists. There is lots of other equipment that aid motorcycle safety. Ear plugs reduce wind noise at medium to high speeds and reduce the risk of hearing damage. A retroflective vest can be worn over your jacket to aid your visibility in traffic. Dirt bike riders often wear an extra suit of plastic armor to protect against off-road obstacles. There are even motorcycle vests with built-in airbags, showing that there is much research going on in the sphere of motorcycle safety. 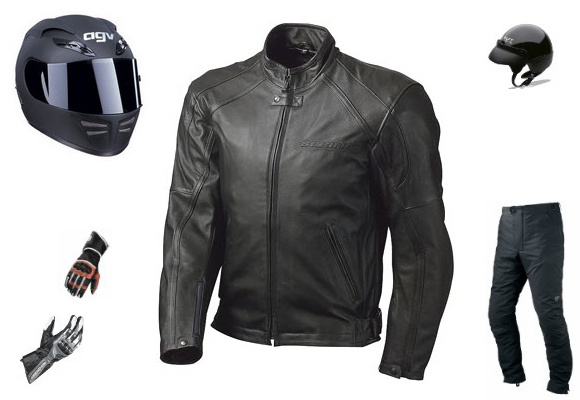 A visit to your local motorcycle equipment store will help you find products to suit your style and needs, and for those of you who know more or less exactly what you want, there are lots of good web shops out there. It is also a good idea to seek out product reviews and product comparisons in magazines or on the internet, to help decide on solid and safe equipment.